In addition to our climate controlled secure storage units we operate a fully equipped workshop capable of providing a complete range of care and maintenance services for your classic or performance vehicle. All work is undertaken by mechanics and technicians with a commitment to the highest quality workmanship and attention to detail. We can arrange for your classic to be put through a MOT test at our partner testing station. 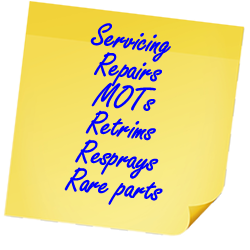 MOT tests can be completed up to one calendar month before the end of your current MOT certificate. We would like to assure clients that there is no obligation to have repair work undertaken with ourselves in the event the car fails to pass a MOT test. 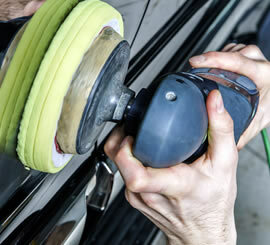 We have the facilities and knowledge to complete resprays, resprays on bare metal and repainting over existing paintwork. Wheels and single panels can also be catered for. All aspects of interior trimming from repair, refurbishment or replacement, with cloths, leather and vinyl sourced to match the original factory interior. We provide a bespoke classic car valeting and detailing service that will enhance the appearance of your vehicle, leaving it spotless inside and out. Are you looking for a particularly rare component or part for your classic? Our day-to-day work involves working with suppliers and businesses providing parts to cars from all manufacturers, models and periods. Please contact us directly to see if we can assist. Our workshops include a DPF cleaning service with a thorough process using the best equipment and a reliable chemical treatment. The service is available for vehicles of all ages. Filters can be sent to us and returned by courier or customers are welcome to visit us in person. Collection and return can be arranged for clients based in the Greater Manchester area and surrounding areas in the North West. Prospective and existing clients can contact our service team by telephone on 0161 567 8910 or through our online contact form. Allow us to take care of your vehicle storage and maintenance requirements professionally and at a competitive cost. Please click below to go to our enquiries page.